USS Alabama began her combat service augmenting the British Fleet protecting convoys on the "Murmansk Run" from England through the North Sea to Russia against German warships and aircraft. The ship transferred to the Pacific Fleet in August 1943, and earned 9 battle stars providing gunfire support for amphibious assaults on Japanese-held islands and protecting carrier task forces from air and surface attack. Alabama was credited with shooting down 22 Japanese planes. Her radar was the first to detect enemy bombers in the Battle of the Philippine Sea, at the unprecedented range of 190 miles. This warning enabled U.S. fighters and anti-aircraft gunners to destroy over 400 Japanese planes. 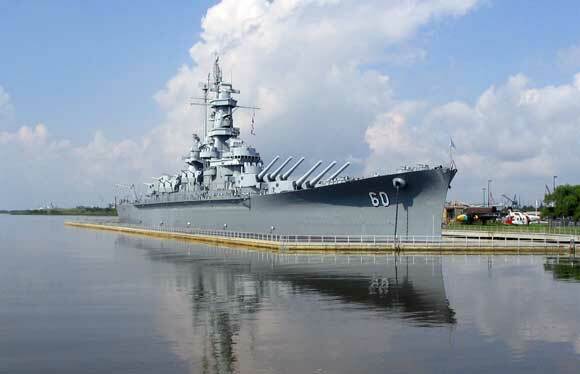 Decommissioned in 1947, Alabama was "mothballed" in Bremerton, Washington until 1964, when she was transferred to the State of Alabama and towed 5,600 miles to become a memorial in Mobile. The Park's artifact collection contains representative Army, Navy, Air Force, Marine and Coast Guard aircraft from before World War II through the Persian Gulf War. Included are a Mach 3+ A-12 Blackbird, the submarine Drum, tanks and artillery. Alabama conducts youth group overnight encampments. USS Alabama is a National Historic Landmark. Return to the HNSA Home Page. Copyright © 1997-2007, Historic Naval Ships Association.